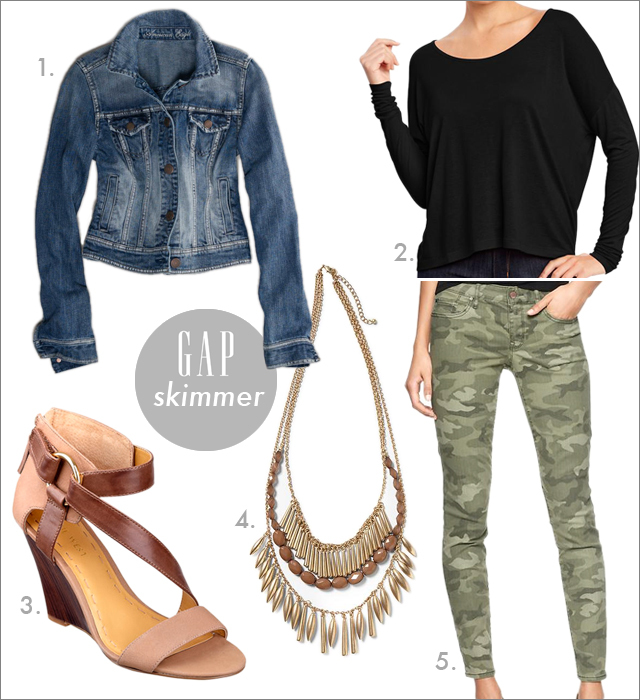 Camouflage print and Gap "the new skimmer" jeans seem to be a trend this spring, of which I own neither; however, if I was to purchase them, this is how I would style them. Also, last year, I purchased a denim jacket from American Eagle, and I love it! I had tried jackets from several different places and this one had the best fit and look. So, if you are looking for a denim jacket, I highly recommend giving this one a try. If you are looking for other ways to style "the new skimmer" jeans - be sure to check out Rach @ Pink Peonies. She is also offering a chance to win a $50 American Express gift card. One last thing, Gap has 30% off today (Code: GAPDRESS). Actually, it is 3 days of savings - 25% off tomorrow (Tuesday) and 20% off Wednesday!